Signed, Sealed, and Stamped with Awareness – Do I Look Sick? Good news everyone! 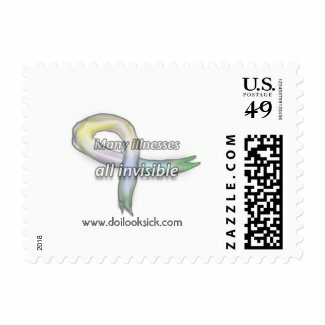 The stamps were approved, and now you can get your very own awareness postage! And it seems like you guys really like this design, which makes me very happy! So I’m working on some more products based on your feedback. If you haven’t voted yet, there’s still time! amazing, congratulations! i love the idea of putting the design on pill boxes! i would totally buy one! Good job! I didn’t vote again, but I still vote for a coffee mug!